Make Your Home or Business Stand Out with Power Washing in Holbrook. Never underestimate the power of clean. Whether you are looking to sell your home or make the best first impression for your business, Premier Polishing offers the best power washing services in Holbrook. From a clean concrete or deck to the best facade free of dirt and cobwebs for your business, Premier Polishing in Holbrook can help. Contact us today! Whether you’re a homeowner or a business owner, we all like the look of clean. Clean is inviting and relaxing. 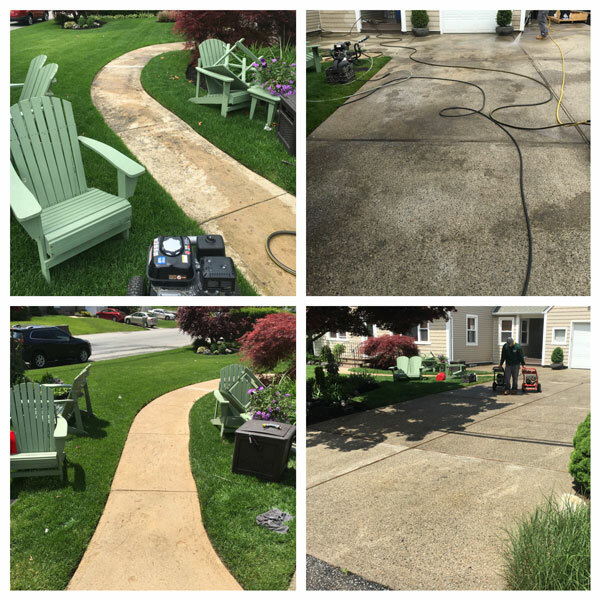 Pressure washing is in essence cleaning your outdoor surfaces, making your space clean, inviting, and soothing — a place you want to spend time in and spend that time with others. 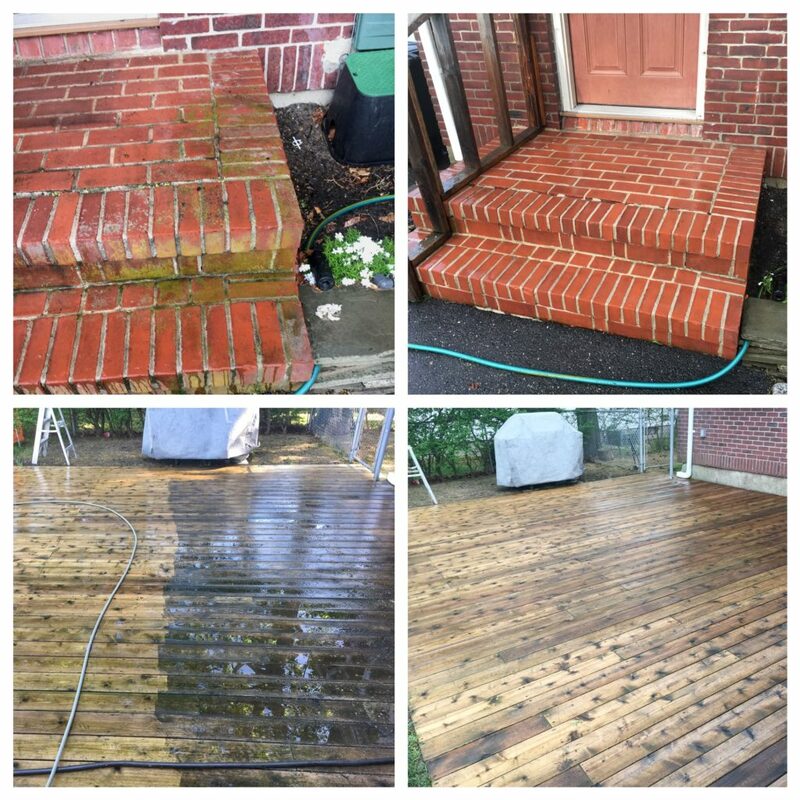 Premier Polishing in Holbrook offers both residential power washing services and commercial power washing services, so you can enjoy your home, deck, patio, driveway, and walkways. Below, we’ll outline our power washing services. Contact us today for your free estimate! FIRST AND FOREMOST: WHAT’S THE DIFFERENCE BETWEEN A PRESSURE WASHER AND A POWER WASHER? While the difference is subtle, pressure washers and power washers achieve similar results. With a pressure washer, the name gives it away. A pressure washer relies on the pressure of the water to do most of the cleaning. A power washer uses hot water during the cleaning process, and the temperature usually can be adjusted. A power washer relies on cold water exclusively. Because the results achieved are virtually identical, the terms have become interchangeable. Thus, in order to distinguish between the two, the term “hot water pressure washer” has come into use to help distinguish the two. Many people think simple soap and water will do when they go to clean their outdoor surfaces. While it’s true water molecules (H20), which are positively and negatively charged, lending to a tendency to stick to substances, sometimes no matter how hard you try, dirt, grime, and bird poop just won’t budge. Adding soap certainly helps since soap in essence helps to break dirt down, which makes it weaker. However, even with both, sometimes your home or business won’t come clean. Water under pressure (about 100-200 times the pressure of the air around the pressure washer) adds force, which helps to knock away the stubborn dirt clog. It’s akin to hitting something with a hammer, but because water is soft, it does no damage like a hammer does. A pressure washer is little more than a simple machine, in essence, a hose, a water pump, and an engine. Using water from your outdoor faucet, the water pump adds the pressure, and you control the release. Water inlet. This is a fancy way of saying the hose that attaches the pressure washer to the outdoor faucet. Usually there’s a filter that filters the water to prevent little bits of dirt and grime getting fired out at great rates of speed. Motor or engine. Some pressure washers run off electricity or gasoline. These engines are equivalent to the power you’d have in your lawnmower engine. Gasoline-powered pressure washers are great if you’re away from a power source, such as pressure washing a detached garage or barn. Water pump. What makes the pressure washer pressurized, the water pump works by sucking water in from the faucet and as the engine pulls the pump, it pushes water out the other end. The engine powers the water pump. High-pressure hose. This is the hose that delivers the pressurized water to your nozzle. The hose must be stronger than your ordinary hose in order to withstand the pressure. This hose is usually reinforced with high-density plastic. Cleaning attachment. The gun or valve that delivers the water in the direction you want it to go. Most power washers also have a detergent container that mixes with the water from the faucet by the water pump. If you have a hot water pressure washer, there will be a heating element to heat the water/detergent mix before it’s administered through the high-pressure hose. Using the latest equipment. When it comes to power washing, equipment is key. You’ll want the latest in technology in order to effectively and efficiently remove all dirt, grass, muck, and grime from your outdoor surfaces. Efficient and timely. Professional power washer technicians have hours of using a power washer to remove dirt and grime from homes and businesses. When you only use your power washer say once a year, odds are it will take you an inordinate amount of time versus a professional power washer. Most of us would rather enjoy the weekend with the kids rather than spend all day Saturday washing the exterior of our home with a pressure washer. Incur no damage. As with all tools and processes, there is a learning curve involved. 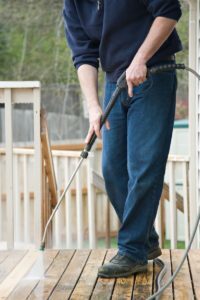 When you first use a pressure washer, your unfamiliarity may cause damage to your home or outdoor patio furniture that you are cleaning. The water from a pressure washer is powerful and should be implemented by someone who knows what he or she is doing. You can even cause harm to yourself if you’re not careful and know what you’re doing. Environmentally-friendly. Professional power washers know the best cleaning agents to use that leave the least amount of impact on our environment. Furthermore, because a professional power washing technician is experienced, he or she will use less water than a DIY user, who will waste water trying in the learning process. Hassle-free. If you’ve put together any kind of electronic device or used any kind of power tool, it can be a hassle. Power washing your entire home and your deck are big undertaking. Avoid the frustrations with a professional power washing service such as Premier Polishing in Holbrook. Creates a healthier environment for your family. Pressure washing your outdoor surfaces removes harmful substances, such as mold, pollen, pollutants, and mildew that could cause your family harm, such as trouble breathing, allergies, or even diseases. Furthermore, it removes the annoying substances such as dirt and grime that your family and pets can track in the house, creating more work and dirt inside your home as well. Increases curb appeal and resale value. Everyone likes clean, especially if you’re in the market for buying a home. You’ll garner more home showings and a higher appraisal if the outside of your home is clean. If you own a business, you’ll gain more customers who see the cleanliness of the outside of your establishment and feel invited in. Parking lots, dumpster areas, and awnings are forgotten areas that customers notice. The employee and client experience will be much improved when all outdoor areas look better. Prevents major damage. Damage to homes, businesses, and offices can be caused by dirt, grime, mold, bird droppings, and algae growth. Corrosion, rust, and cracks are common occurrences as pollutants sit on your outdoor surfaces and begin to cause rot. Prevents injuries. Injuries at the workplace are quite common. Professional power washing can help prevent slips and falls from grime on the sidewalks and pathways. Maintenance is key for long lasting products. Don’t take any chances when it comes down to the exterior of your home or office building. Power washing your house, deck, fence, concrete, pavers, and much more will save you tremendous amounts of money down the road. The winter season can cause serious damage and leave your home/office and exterior surfaces looking gloomy if they are not properly taken care of. We use heated pressure washers that allow us to eliminate the use of chemicals other companies would use which could potentially harm the environment. Premier Polishing in Holbrook offers the best residential and commercial power washing services. We are licensed and insured and have years of experience in operating pressure washing equipment. Premier Polishing also specializes in polished concrete and sealed pavers. We are a certified dealer of HIPERFLOOR® by Husqvarna, and we invest in ongoing training for all of our employees. We offer free estimates on all of our services. Having a clean home or office building will leave you feeling great. Contact us today!